Many website, SEO, & Pay-per-click (PPC) projects we oversee are for well-established companies with significant budgets. We are often most proud, however, of those we do for newer companies seeking the finest in Search Engine Optimization (SEO) and high-end website design. 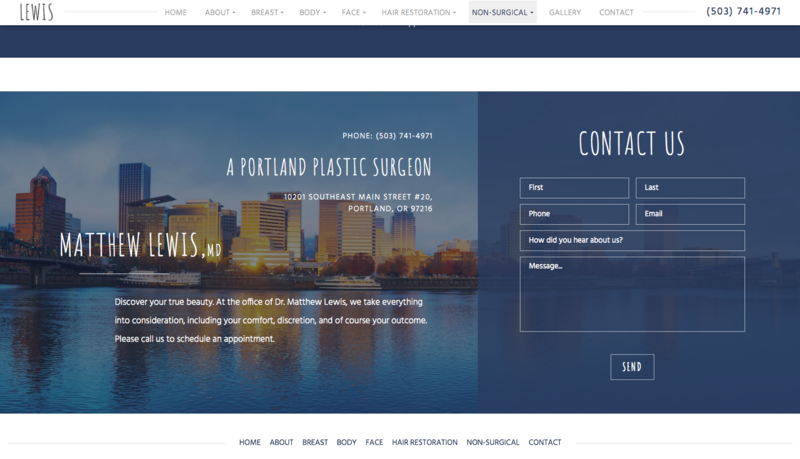 Here, we devised a strategy for a Portland-based plastic surgeon who was relatively new, seeking a unique website design for his new business, and one that made up for the typical volume of before and after photos most tenured plastic surgeons showcase in their gallery. 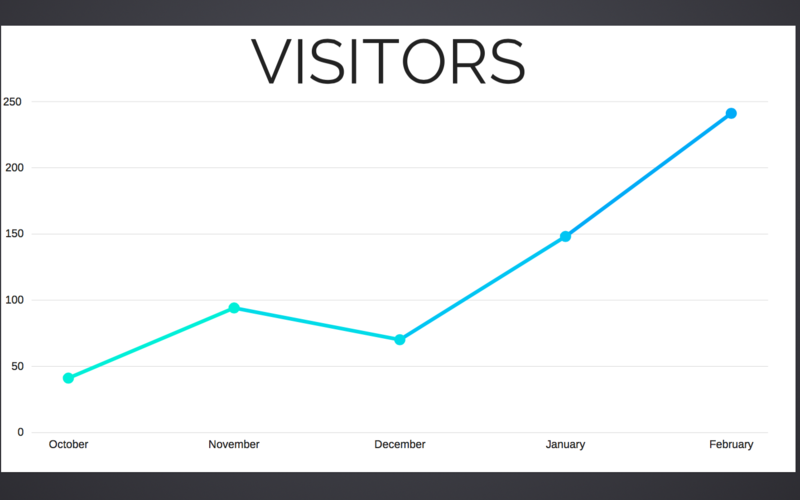 Within just a few months we had a beautiful website live and significant growth in organic unique website visitors and a massive increase in lead volume. 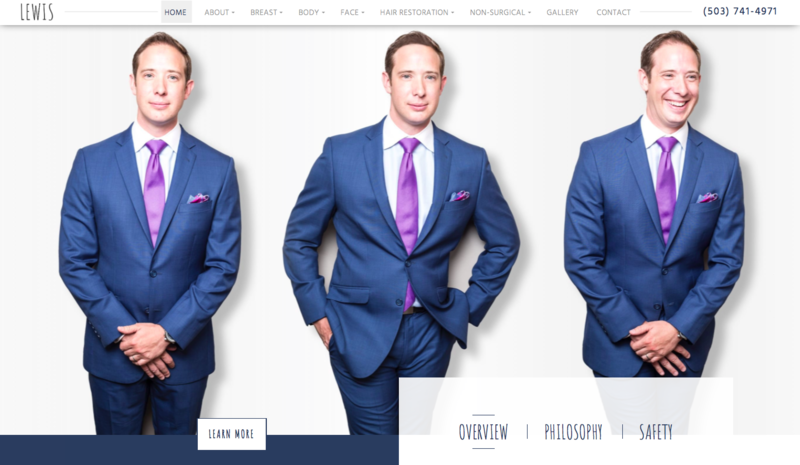 Dr. Lewis' investment in his website was paid off by the 2nd surgery converted through leads generated by the website and his monthly SEO fees are paid easily by the first handful or two of leads generated monthly even though he was regularly receiving over 30 per month less than a half year into the site's life. 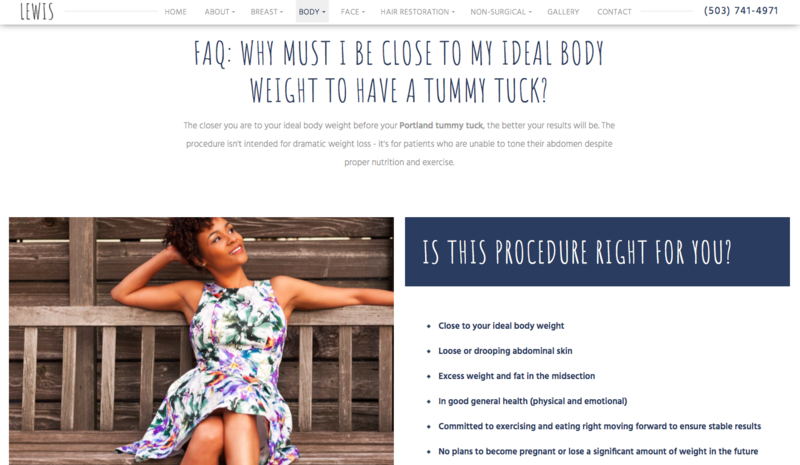 Dr. Lewis wanted to create a unique practice in a unique place. While "Keeping Portland Weird" was not the vibe we sought for the website, understanding the location, differentiating this website from any other in the area through design elements like professional photography and unique fonts, and being willing to have fun with a serious subject helped create a website that consistently has converted leads at over a 10% rate. This is more than double the national average for similar doctor websites we have observed over the last decade. SEOversite constantly works to create an easy-to-navigate website using best UX/UI practices. At the same time, content is part of what makes your website king, so we balance that easy of navigation with ensuring our Preferred Vendors use a variety of well-written content. It's a difficult balance, but one at which our vendors and we excel. This website did not replace an older website and had zero visitors at culmination. We knew that the importance of high conversion rates was not to be understated. By using luxurious, local photography, having a consistent feel through the selection of unique fonts showcased in easy-to-read fashion, and having (as with all SEOversite work) a focus on multiple contact points at all times on-page, we'd be well on our way to having a world-class site when it came to conversion. Over 50% of search is now performed on mobile devices. That is likely more true in places like Portland, Seattle, Silicon Valley, NYC and the large, tech-centric areas of the country. Having a sleek, modern, mobile responsive site is now a necessity. 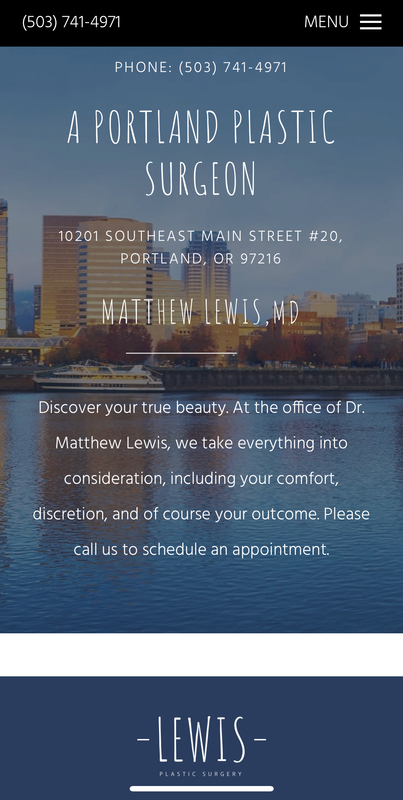 Dr. Lewis' website maintains the key aspects on mobile we seek: personality and fun, easy of reading, simple navigation, many calls-to-action, and impressive visuals & photography. Most website marketing agencies will honestly share that it can take 6-12 months or more to achieve significant rankings and site visitors, particularly in a difficult market like Portland. In just 6 months, our Preferred Vendor, with our SEOversite LITE PLUS oversight, achieved massive early growth. Did these new website visitors turn into leads? Yes! As noted above, while any given month can ebb or flow (February for example has 10% less visitors than other months simply by having 10% less days by nature), you can see the impressive early results achievable for a new doctor, without a photo gallery, directly from launch, in a high-competition, costly market. 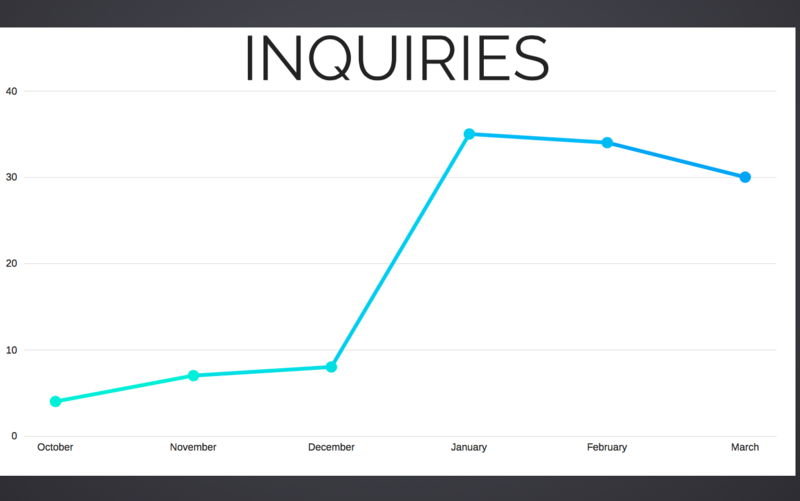 We achieved around a 10% conversion rate from visitor-to-lead with 3 months in a row over 30 unique inquires. Contact us today if you'd like to see what SEOversite and it's team of superstar vendors can do for your online presence.